This installment will begin with an overview of one of the simplest—but also most important—concepts in any reserve plan. In the same way that a home requires a solid foundation to build upon, a suitable reserve plan is only as good as its basic building block: the component list. The key figures incorporated in the component list serve as the ingredients for all of the financial calculations and subsequent conclusions that the association will use for annual budgeting. If this list is incomplete or inaccurate, the association will be exposed to more “surprise” expenses, which are at the very least a nuisance and at worst, a financial disaster. Before we move on, let’s provide some background information and clarify basic terminology. In 1998, the Community Associations Institute (CAI) established the National Reserve Study Standards (NRSS), which serve as a reliable set of guiding principles for reserve planning throughout the United States. Under NRSS, reserve “components” are defined as “the individual line items in the Reserve Study, developed or updated in the Physical Analysis.” In Florida, the component list is just one portion of what is commonly known in a larger sense as a “reserve schedule.” In addition to the component list (as defined by CAI), a reserve schedule also includes important financial data, such as how much money is already allocated to components, and required funding amounts for each component. These other elements of a reserve schedule will be covered in greater detail in future installments of this series, so for now, we’ll limit the discussion to the fundamental constituents—the components themselves. Generally speaking, reserve components consist of projects. These projects might include repairs, replacements, modernization, or maintenance to existing assets maintained by an association, such as elements of a building envelope, common area interiors, mechanical systems, site improvements, amenities, and other physical features. In some cases, there can be multiple components related to one physical object or piece of equipment. For instance, an elevator at a building may require two components on the list: one for mechanical modernization and another for aesthetic remodeling of the cab interior. Another example could be a fishing pier, with separate components for periodic re-decking and repairs and another for total replacement, including pilings and other structural components. There’s a key point to address here: reserve components are not reflective of the addition of totally new assets. For instance, if an association doesn’t currently have a swimming pool, it cannot include a reserve component for adding a new pool. This should be handled as a capital improvement project, not utilizing existing reserve funds. However, if the association does pursue such a project, future costs related to the pool (resurfacing, re-tiling, replacing heaters and filters, etc.) may be added to the component list at a later date. ium associations, as condominiums are generally subject to tighter restrictions than homeowners associations.) Many readers will be familiar with Florida statute 718 (also known as the Condominium Act), and its requirement that condominiums maintain reserves for roof replacements, building painting, pavement resurfacing, and any other components with a current replacement cost above $10,000. This notion is well-publicized and understood among most associations and industry professionals. However, the Act does not specify why the $10,000 figure is used (as opposed to $2,000, $5,000, or even $20,000), and does not provide any stipulations regarding the size of the condominium in question. Unless an association’s governing documents specify any additional requirements, the statutes are the basic standard to follow. In practice, this means that a tiny six-unit condominium in the Florida Keys is subject to the same requirements as a massive high-rise development representing hundreds of unit owners in downtown Miami. This can lead to serious oversights for smaller associations. Let’s say that the six-unit building has a shared air conditioning system with a replacement cost of $7,500. If the board of directors is only relying on the statutes for guidance, this component may not be added to its list. As a result, the $7,500 replacement cost may one day come as an unpleasant surprise to the unit owners, who would be faced with a potential special assessment amounting to $1,250 per unit. Clearly, they would have been better off by adding this key asset to their component list, thereby spreading the replacement cost over many years in the form of budgeted reserve contributions. For comparison, we can view this question of what components to include using the lens provided by NRSS. The NRSS definition is more open to interpretation and does not name any specific physical elements. Rather, it provides a flexible, multi-part approach to determining what belongs on a component list by defining the characteristics of reserve components as follows: “1) association responsibility, 2) with limited useful life expectancies, 3) predictable remaining useful life expectancies, 4) above a minimum threshold cost, and 5) as required by local codes.” This definition does not conflict with the Florida statutes, and typically will yield a more comprehensive, appropriate list of components for an association. By using the NRSS definition, the six-unit building mentioned above would likely have determined that a $7,500 expense meets a “minimum threshold cost” for planning purposes and added the HVAC system to its component list. Now that we’ve established the basic concept of a component list, let’s examine the specific data assigned to each component: useful life, remaining useful life, and replacement cost. The useful life of a component is how many years it can be expected to serve its purpose, starting from the original installation or most recent replacement. The remaining useful life is exactly what it sounds like: from a specific point in time, how many more years will the component last? The component’s “purpose” as used here will vary based on the nature of the value it provides. For instance, consider the useful life of a pool heater. The heater has no aesthetic importance. No one sees it inside a fenced enclosure or in an equipment room—its only job is to reliably heat the water in the pool. So, its useful life would be the approximate number of years that it will do so. On the other end of the spectrum, what would be the useful life of the furnishings in a building lobby? The furnishings serve no mechanical or functional purpose. In fact, some residents may walk past the sofa and armchairs every day they live in the building without ever taking a seat. In this case, the useful life of the furnishings should be based on how many years they will provide good curb appeal to the residents and to potential buyers. How long can that be? It depends on the aesthetic preferences of the association, the standards in the neighborhood, and other subjective criteria. In summary, each component is different, and creating a realistic component list often means weighing both objective and subjective benefits in order to determine what is best for the association. The last key detail is the replacement cost. Of the three values presented on the component list, this should be the most straightforward: what would it cost to repair/replace/maintain/modernize this component at current market prices? The key here is to make sure to include all costs related to the project. Materials and labor, permitting, taxes, consultants’ fees, and any other expenditures related to a project should be factored in. Once these three values are assigned to each component, the resulting list can be used to forecast the timing and cost of future expenses. As time goes on, the component list will need to be updated based on actual project history, new input from vendors and consultants, observed physical conditions, etc. If done correctly on a regular basis, the component list will continue to serve as the foundation of a great reserve plan for years to come. In our next installment in this series, we’ll begin to explore the financial side of reserve planning, starting with a key question each association must ask itself: when it comes to reserve funds, how much is enough? Will Simons, RS is the President of the Florida regional office for Association Reserves, one of the oldest and largest reserve study providers in the country. Since 1986, the company has prepared more than 40,000 reserve studies for community associations throughout the United States and abroad. 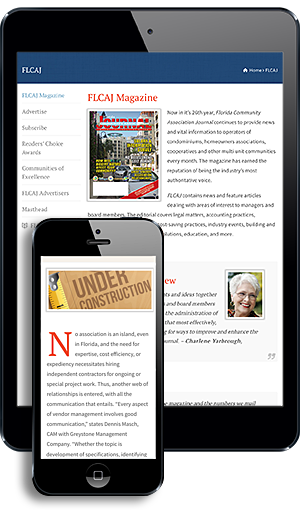 Highly regarded for its excellent customer service, attention to detail and user-friendly reports, the company has been recognized as a multiple-time Readers’ Choice Award winner by the Florida Community Association Journal. For more information about the company, you can visit www.ReserveStudy.com.